some know I am a fan of tiny homes so while poking around today I came across some very interesting sites and some incredible designs. this link shows most of the entries on top, click on one of the pics for the page to load up. 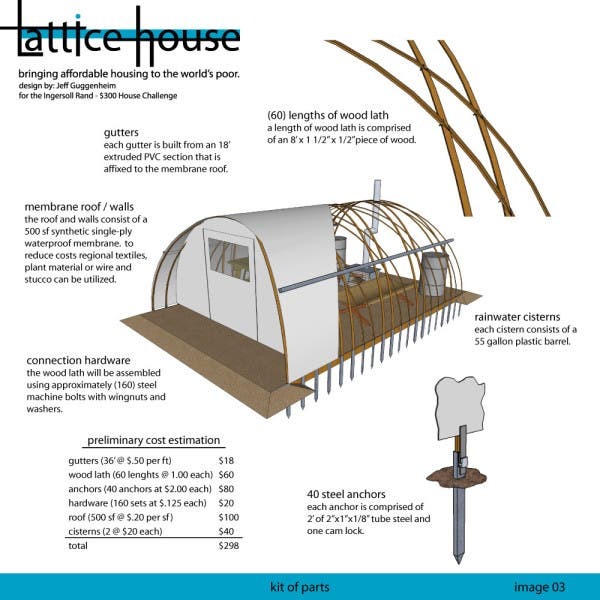 The lattice house is a good concept that looks to be based on the old quonset barracks. His estimates are wayyyyyyy way off. The Hardware price list is so off in left field that I have only wished these prices in dreams I have had. The membrane he has priced must be for tar paper. I dont want to nit pick but I could make a home and create something great with prices that are inaccurate. I do like the tiny home site and visit it often. Thanks for the links WildE. i did not see the list area, will go back and read it again, thanks. I just like the design, thought that I could do that with reclaimed materials. The design of it is great but the lattice would not hold up to any real wind threat. If the outer skin was of mesh with rebar and shotcrete or plywood with laminated fiberglass it could be done. 'A' frames are cheap enough too.